Cesarean section is a surgical procedure in which a doctor creates a surgical incision in the abdomen to deliver a baby. According to the American College of Obstetricians and Gynecologists, complications are rare, but they do sometimes occur. Wound complications are among the most common and least severe complications of the procedure. 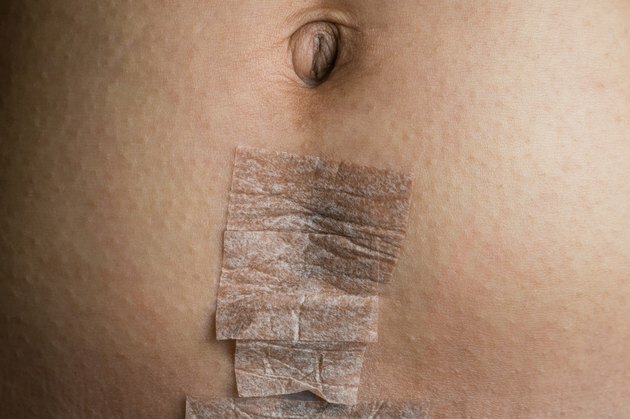 Wound infections after a Cesarean section develop when bacteria on the skin gain entry and then multiply inside the skin. Symptoms include redness, heat, swelling, tenderness and discharge--especially foul-smelling or green, yellow or white discharge. Severe infections also produce systemic symptoms such as fever, fatigue, lethargy and poor appetite. Most infections require exploration and drainage of the wound with a scalpel in order to release pus and remove dead tissue, followed by oral or intravenous antibiotics. According to Dr. Mark Incerpi, professor of maternal-fetal medicine at the University of Southern California's Keck School of Medicine, the rate of Cesarean wound infections has dropped to about 1.5 percent with the introduction of antibiotics given before or during the procedure. Hematoma represents the second-most common Cesarean wound complication, occurring after approximately 1.2 percent of deliveries, according to a March 2010 study in the journal, "Archives of Gynecology and Obstetrics." The term "hematoma" refers to a mass or collection of blood. During a Cesarean section, doctors close the abdomen in layers, first suturing the uterus, then the abdominal wall and, finally, the skin. In the short term, multiple layers of closure serve as a barrier against infection. Wound hematomas develop when bleeding occurs after the wound has been closed. Blood becomes trapped and exerts pressure on the surrounding tissue, squeezing out nutrients and oxygen. If the pressure becomes great enough, it can compromise the sutures, creating a portal for bacteria to enter the body, while the blood itself provides a nutrient-rich growth medium for those bacteria. As with infection, treatment requires exploration and drainage of the wound with a scalpel, and sometimes antibiotics. Dehiscence, or separation of the wound margins, is the least common complication of Cesarean wounds, occurring in about 0.02 percent of cases, say the authors of the "Archives of Gynecology and Obstetrics" report. Dehiscence can occur as a result of hematoma or infection, when tension on the wound causes the margins to break apart, or when nutritional problems or chronic disease cause the body to abandon the healing process. Doctors commonly advise Cesarean section patients to restrict activities such as lifting, driving and abdominal exercises for a few weeks after surgery to reduce the risk of tension dehiscence. Regardless of the cause, a dehisced wound cannot be stitched closed again. The wound must be allowed to fill in naturally, a time-consuming process that inevitably results in a larger, irregular scar.